Today's staff picks are preceded by this very important announcement: THERE'S ONLY ONE MORE WEEK UNTIL THE FILM FESTIVAL!! The Documentary Staff Pick of the day tells the tale of three American human rights activists and educators (Sarah Shourd, Shane Bauer and Joshua Fattal) who went hiking in Northern Iraqi Kurdistan in July 2009, and were captured and held as political hostages by the Iranian Government for more than two years. With limited access to diplomatic intervention -- the Swiss Ambassador, the Sultan of Oman, and behind-the scenes American efforts played a role -- the plight of the three, through family and friends, sparked a grassroots movement that eventually caught the attention of Desmond Tutu, Sean Penn and Cesar Chavez. Far more than a story of wrongful imprisonment, The Three Hikers is a testament to courage, endurance and the power of love. Electrifying filmmaking. Two old friends take an awkward walk into their past. Jesse Ritter has been living with a secret. A small town in Northern France, Alex, a young skinhead, enters Malik's grocery store. 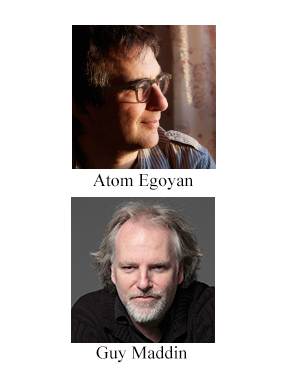 Come and check out this year's conversation panel with this year's Honorary Award Recipients Atom Egoyan and Guy Maddin. With fifteen feature films and related projects, Atom Egoyan has won numerous prizes at international film festivals, including the Grand Prix and International Critics Awards from the Cannes Film Festival, two Academy Award nominations, and numerous other honors. His body of work - which includes theatre, music, and art installations - delves into issues of memory, displacement, and the impact of technology and media in modern life. Among his films are the groundbreaking Exotica, the multi award-winning The Sweet Hereafter, Felicia's Journey (starring Bob Hoskins), Where the Truth Lies (with Kevin Bacon and Colin Firth), Devil's Knot (with Reese Witherspoon and Colin Firth), and the forthcoming Remember (starring Christopher Plummer), which makes its U.S Premiere as the Opening Night Film at the 2015 Woodstock Film Festival. Guy Maddin is one of Canada's most celebrated filmmakers. He has directed numerous shorts and eleven feature-length movies, including The Saddest Music in the World, My Winnipeg, and recently, The Forbidden Room (Closing Night at the Woodstock Film Festival). His most distinctive quality is his penchant for recreating the look and style of silent or early-sound-era films. Maddin drew inspiration from the films of John Paizs, experimental shorts by Stephen Snyder, Luis Bunuel's L'Age d'or, and David Lynch's Eraserhead. He has stated in numerous interviews that these "were movies that were primitive in many respects. They were low budget, they used non-actors or non-stars, they used atmospheres and ideas, and were unbelievably honest, frank, and, therefore, exciting to me. They made moviemaking seem possible to me." He has held to these ideals ever since.